48 piece assorted mold set in fun shapes and sizes. Includes sealife, vehicles, animals, castles, shapes and number molds including 4 special 3D animal molds. Also includes a spade, trowel and a roller sand shaper. 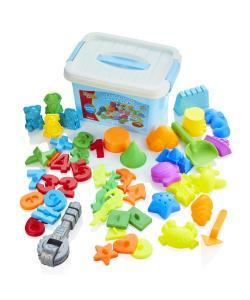 This set provides hours of sand molding fun in the sandbox or at the beach and quick clean up, as all the molds store neatly in the jumbo storage box.